The first electromechanical computers occupied whole buildings, making them rather unwieldy; in the 1950s, an effort to create a "portable" computer called the DYSEAC bore fruit in the form of a computer on wheels that could be relocated, provided you had the trucking logistics to move two trailers with a combined weight of 20 tons. The DYSEAC has a fascinating story that has been captured in oral histories from the Computer History Museum, which collected Henrietta Lenier's recollections of her husband Alan's work on the system, created by the National Bureau of Standards for use by the US Army Signal Corps. Ernie Smith traces the history of DYSEAC and its ever-more-portable successors, such as the RECOMP (1958, 197 lbs) and the SCAMP (1973, 50 lbs). That said, it was incredibly limited by modern standards. For one thing, it could only hold 512 words in its storage, initially relied on a relatively small number of vacuum tubes, could only initially handle 11 types of instructions, and had a memory cabinet that was five feet wide and seven feet high. (The computer itself, while small for its day, was much larger.) It was not a machine that could be easily taken on the road. But it was nonetheless a huge leap forward in computing, and was used for, among other things, the first photo-scanning device used with a computer. 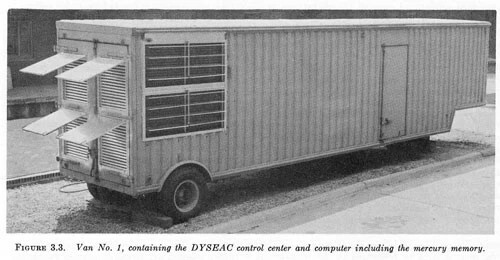 DYSEAC, conceived around the time SEAC was in its completion stages, used the prior machine as a jumping-off point. A 1951 document on DYSEAC’s design, written by Alan Leiner, explained in detail the expected similarities and differences between the devices. DYSEAC, which would come online around 1954, would share some design decisions with the older machine but it would have a wider array of functions. “Of the 16 types of operations performed by the DYSEAC, five types are the same as those in the SEAC, five types represent variations or expansions of their SEAC counterparts, and six are either entirely new or completely revised,” Leiner wrote, citing one example.